very recently we successfully implemented the consumption of S/4HANA Cloud (named “S4HC” in this blog entry) data from an on-premise BW/4HANA (named “BW4H” in this blog entry) system. Data on the S4HC side has been exposed via OData V2 services on top of both custom and standard ABAP CDS views. 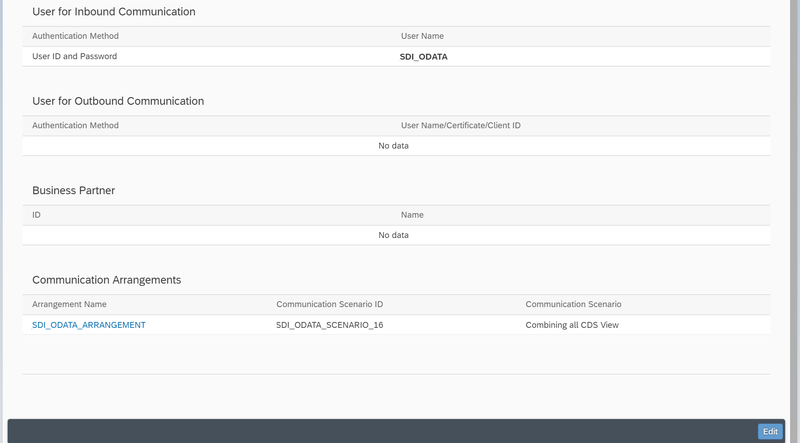 We move the data towards the target (on-premise) system using the SDI ODataAdapter. The target is a BW4H system. Data is replicated on database level using SDI replication tasks as a development artifact. On the BW/4 layer, a local HANA data source is used to access the replication schema and therein the tables. At the time working with the scenario, the release in S4HC was 1808 and the on-premise HDB was on SPS12 Rev. 20. As an alternative, in BW4H you could execute a direct write into an ADSO using an SDI OData Remote Connection, just to be mentioned. This blog entry purely focuses on functional and technical aspects of the scenario. It does not address any license related aspects regarding the usage of the software components mentioned in this blog entry. In any case you must clarify the license and software usage side before implementing such a scenario with your SAP Account & License Expert to be on the safe side. Please also don’t raise any questions in relation to this context in the comments section. 2. What can you expect from this blog entry? You can expect details about the configuration of the introduced scenario step-by-step, how to avoid pitfalls and some general aspects around the given context. 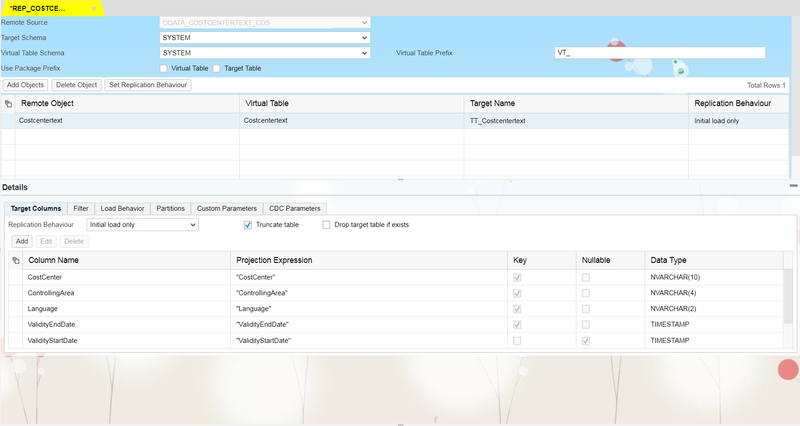 The configuration and implementation is described end-to-end, involving both activities on S4HC as well as on the HANA DB on-premise. A very simplified architectural sketch outlines some of the main components involved on both sides. In the following you will be provided with an overview on the required configuration steps in both S4HC and the HANA target system. Subsequently, a detailed description of how to execute these implementation steps is outlined. The steps required on the S4HC side are outlined in this blog entry. However, there are plenty of other blogs on this topic, on a much more detailed level available. Refer to other contributions that deal with the S/4HANA related configuration & setup by going into the “References” section of this page. 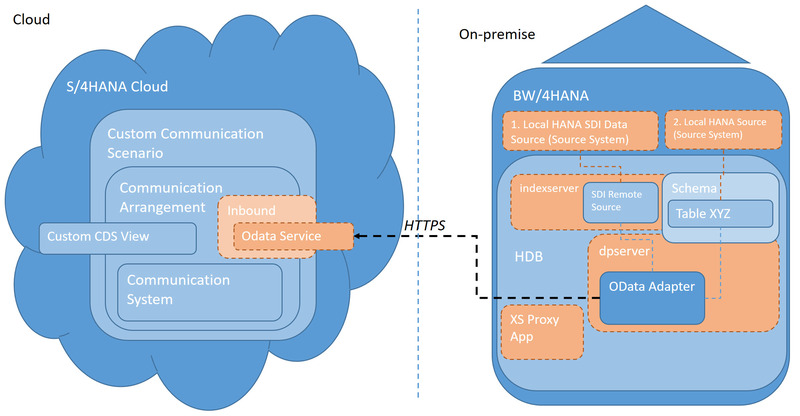 The steps explained herein target the SDI software component setup and its configuration on the HANA side. It involves some basic steps to configure and shows the ease of use of SDI. Based on the standard I_CostCenterText CDS view, our custom CDS view “CostCenterText” is built. You have to tick the “External API” box. In S/4HANA Cloud, a communication user has to be maintained. 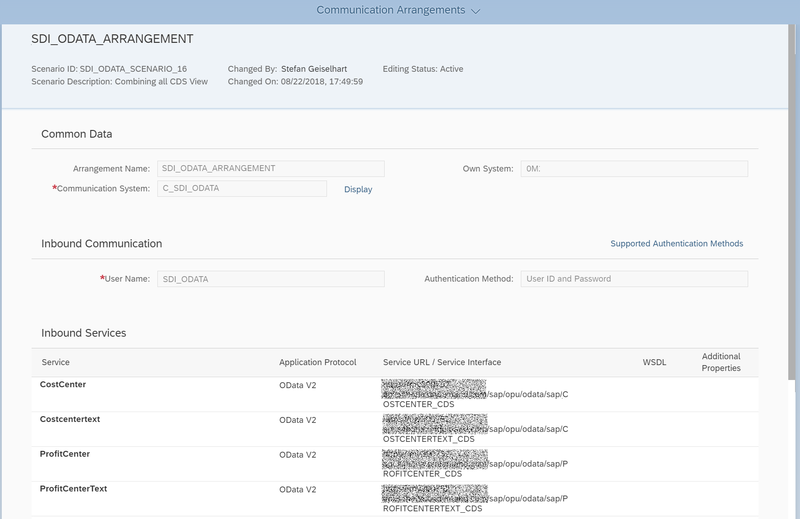 This communication user is used in all of the SDI remote sources and will authenticate against the S/4HANA cloud system. 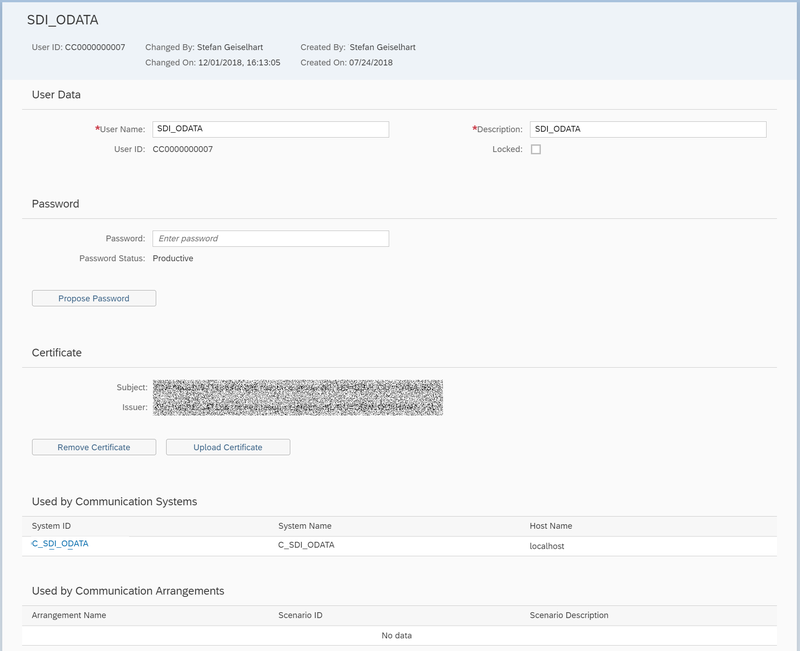 In the certificate section, the HANA certificate of the target system has to be uploaded, else the connection can’t be established. A communication arrangement defines a set of inbound services and respectively the communication user which has to be used to consume one of the services. In this screenshot, a set of services are shown, including the Costcentertext service which we have initially created. The communication system defines the actual S/4HANA system by providing localhost and the HTTPS port. Remember, the OData Adapter is not a system adapter (other than the well-known SDA adapters). The adapter is C++ based and doesn’t run on the DP-agent side, it runs in the DP-server of HANA. We have faced a SSL related error, that could be narrowed down to a missing CA list on the server. With HANA 1.0 SPS12 there has been a refactoring, so XS Classic will use the common crypto for all encrypted communication. This caused a different behavior, if a server is requesting a client certificate, but does not send a list of trusted CAs along with the request for the certificate. Since there is no selection criteria for the client certificate available, common crypto can not decide, which certificate should be used from the truststore. Hence, the handshake fails. CREATE REMOTE SOURCE "COSTCENTERTEXT_CDS" ADAPTER "ODataAdapter"
This represents the view on the remote source from the web development workbench. The higher the data volume is, the likelier it will be that some custom data flow must be modelled to only reflect delta data being loaded. For this purpose a flowgraph can serve the need. For further reference how to reflect custom delta logic, take a look at my other two blog entries about using HANA SDI in various contexts. These are mentioned under “References” on this page. (5.) The very last step is to be done of the BW4H side: Creation of an SDI Source and then likewise the modeling on top of the entities the SDI remote source contains. 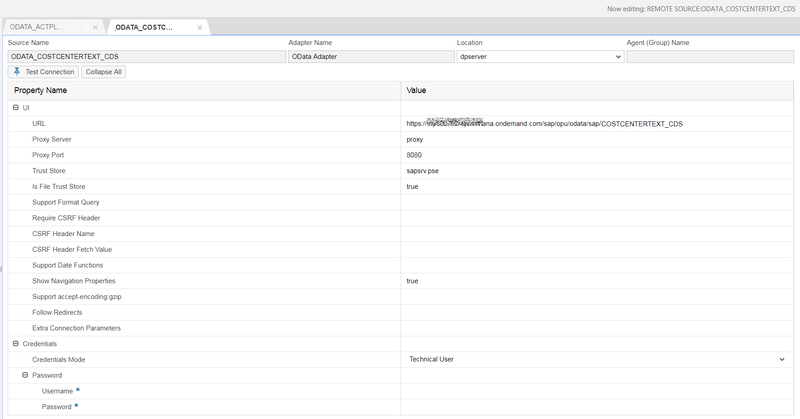 Of course you can also directly consume the tables you have replicated into your schema or build e.g. CalculationViews on top.